All the comforts you’d expect from the best pet motel around. At Caroline’s Pampered Pet Motel, our rooms are so comfy, you will even be jealous of them. The comfort and accommodation our rooms provide ensure that your pet will feel right at home during their entire stay. When we say, “our rooms,” we really mean it. At Caroline’s, you’re not leaving your dog or cat in a cage or kennel. Each pet at our motel gets an entire room to themselves. See for yourself why the rooms at Caroline’s Pampered Pet Motel give your pet the comfort they deserve while giving you the peace of mind not offered from those traditional kennels. We pride ourselves on not being classified as a kennel. In order to avoid the “kennel” label, we provide the pets in our care top-notch comfort. 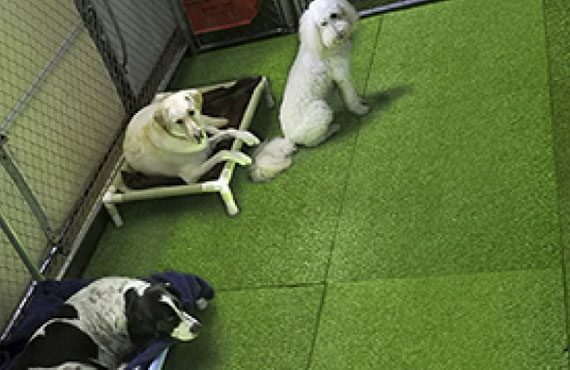 Our rooms make those chain-link fences and cages offered by traditional kennels a thing of the past. What we have to offer are actual rooms. Depending on your pet, we offer various room sizes and more than enough space for them to get comfy and relax. The comfort and convenience our rooms offer will make them feel right at home. For the more active dogs or the outdoor enthusiast, we have rooms in our indoor playroom with pet grass and room to wag their tail. 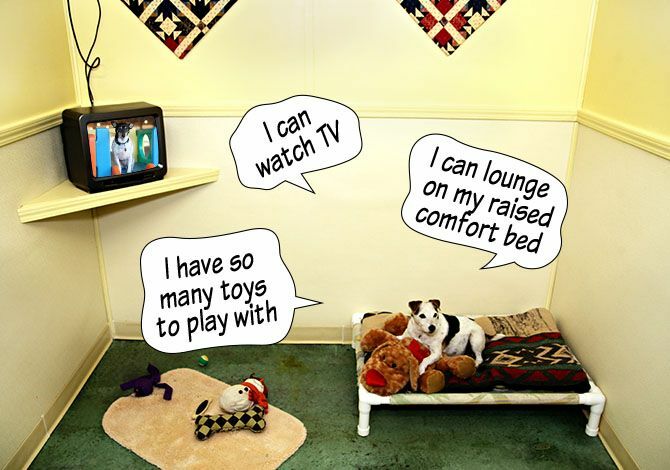 Our rooms come equipped with beds, blankets, rugs, music and even a television if your pet prefers it. All of our rooms have comfortable air conditioning and heating, so you will never have to worry about your furry friend shivering through the night on a cold, hard concrete floor. We vacuum and mop each of our rooms every day, and give them a deep cleaning once a pet checks out. This means your pet’s room is always clean, safe and ready to be enjoyed. To top it all off, we also have an onsite laundry facility in case your pet’s favorite bed or blanket gets dirty during their stay. Dogs aren’t the only ones having fun at Caroline’s. Cats are more than welcome, too! Our rooms, or “Cattery,” are a closed environment. This means your cat’s room is away from any other animals and is virtually soundproof. 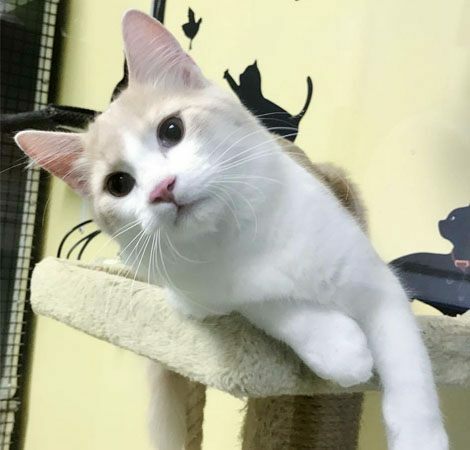 The only sound your feline friend will hear is the soothing sound of the provided television, if that is what they prefer. The “Cat Condos” we offer are strikingly similar to a duplex. The living quarters are in one room, while the litter box is in another. Want a more personal experience for your pet? We do too! Caroline’s Pampered Pet Motel encourages you to fill your pet’s room with all their favorite items from home. Whether it’s beds, blankets, crates or toys, you are more than welcome to bring as much as you want. If you don’t feel like packing, we offer queen and king-size doggie beds with blankets as well. What it really comes down to is this: we know there is nothing worse than leaving your beloved pet in a cold, confined cage or kennel. That’s why we work hard to provide comfortable, enjoyable rooms that let you rest easy while you’re away. There’s a reason we were voted #1 in the Ozarks. Our rooms make your pet feel right at home, 24 hours a day, for as long as they stay. We treat your pet as if they were family, because we know that’s what they are to you. To give your pet the pampered stay they deserve, fill out our reservation form and give Caroline’s Pampered Pet Motel a call! Please print off your form, and bring it with you on your first visit, or the day of your pet's stay. Payment is requested at time of drop-off. SITE DESIGNED BY RED CROW MARKETING.